LCS - ORION - 5M - ULTRA SERIES - HDMI 1.4a Version 15.2Gbps - High speed with ETHERNET and 3D - New enhanced technology ARC - CEC - Video Signal High Performance including Deep Color und x.v.Color - 1080p to 2160p (Digital Cinema Format) - 24k Gold plate by GadgetCenter at Zonita Cinema. MPN: Orion 5m. Hurry! Limited time offer. Offer valid only while supplies last. Model: * ORION * Product Description: : ORION is our new serie of high quality HDMI cable, it will satisfy all users looking for a high end cable. ORION is our new serie of high quality HDMI cable, it will satisfy all users looking for a high end cable. Flexibility , quality and design are assets that users seek. Triple shielding provides maximum protection and good transmission of audio and video. The new HDMI 1.4 standard benefits from increased bandwidth compared to previous versions, giving you the pleasure of discovering and enjoying movies with impressive quality in either 2D or 3D. Thanks to Deep Colour technology, colours are more vivid and the image is sharper. Very good value for money. Latest HDMI technology version 1.4. High-speed Ethernet to share your internet connection. Backwards compatible with all previous HDMI versions. Excellent signal transmission : HD audio and 1080p video. Visible improvement of image quality on HD screens. Enhanced 3D rendering effect, projecting the viewer into the heart of the action. "ARC" function enables the transfer of audio signals through the HDMI cable to your TV or amplifier. Molded plug with metal reinforcement : Optimal connection for accurate performance. Ergonomic connectors providing good mechanical support to the socket. 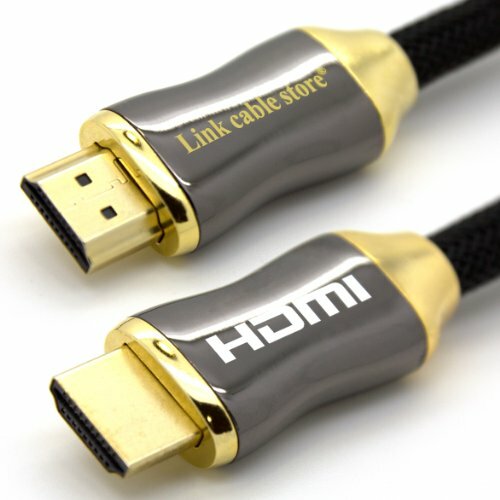 Product marketed under the trademark Link Cable Store ? If you have any questions about this product by GadgetCenter, contact us by completing and submitting the form below. If you are looking for a specif part number, please include it with your message.